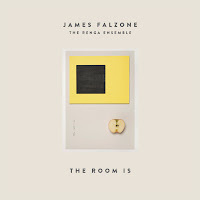 Working with an impressive cross-section of (mainly) Chicago based woodwind players, clarinetist and composer James Falzone's The Room Is is a complex and lovely work. The group, The Renga Ensemble, is comprised of Ken Vandermark on Bb clarinet, bass clarinet, baritone saxophone, Keefe Jackson on tenor saxophone, bass clarinet, contra Bb bass clarinet, Jason Stein on bass clarinet, Ben Goldberg on Bb clarinet, contra Eb alto clarinet, Ned Rothenberg on Bb clarinet, alto saxophone and Falzone on Bb and Eb clarinets. Together, they interpret these sophisticated charts rather stunningly. Track one, 'Prelude' is a legato piece, brief and classical in structure, it is foreshadowing of the rich tonal palette that the group will use through the rest of the tracks. Track two, 'Not Seeing', takes a syncopated riff and spreads it across all of the players, then as the tune progresses, the different sounding woodwinds swim in and out of harmony as bluesy smears are layered atop complex counter melodies. Track three, 'The First Renga (Ben)', begins with a lively melody and as the other instruments enter, it grows stronger against the pulsating background, lithely continuing to the close of the mid-tempo track. Track four, 'The Fourth Renga (Ken)' is fraught with tension, employing trills and a touch of extended technique. The rich tones of the low reeds help push the song forward. The Room Is is a gorgeous album, and it is music that requires repeated listening. you people are doing god's work here, nobody else has reviewed this and it is such a great album.